This is an international swap. Swappers in good standing only, please. It would be great to have your creativity in the mix; I hope you'll drop something to make room for secret message crafting. 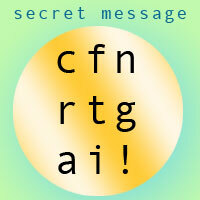 I've been thinking about messages and codes. I haven't settled on one yet; I think I will wait til I assign partners and then tailor it a little bit. Have you got an idea for your coded craft yet? I'm undecided too at the moment, although I have a couple of ideas... I have at least decided on the message I'm going to encode, which is a start! Here we go! Partners are assigned. Enjoy the coding and crafting. Hope everyone is getting their messages coded. If you think you'll need more time, please contact your partner. I ended up doing a binary-encoded wrap necklace. It spelled out a quote from my partner's favorite fiction. She liked it! My package is all ready to go to the post office on Monday morning - hope you enjoy it! Can hardly wait to see what you've done! OMG, that was brilliant, spoonergregory. Thank you!